This recent glass shower enclosure project was for a new loft conversion in a period property in Hascombe, Surrey. The homeowner wanted to combine the original character of the attic with all the desirable features of a state-of-the art shower, and called on Showerpower’s glass expertise for help. Showerpower recently helped to make a Hampshire couple’s steam shower room ideas a reality with custom-made glass and specialist expertise. An international interior design company based in Paris and Ireland, Clive Christian, invited us to create and install bespoke frameless glass for a prestigious bathroom scheme on the Wentworth Estate, in Virginia Water, Surrey. The brief to Showerpower was to survey, supply and install two completely bespoke frameless glass shower enclosures for a master bathroom and guest bathroom. A family from Cranleigh, Surrey came to Showerpower as they were planning to renovate their old bathroom and hoped to be able to incorporate a separate frameless glass shower unit. The owners of an attractive timber-framed residence in Lurgashall, near Petworth, in the Chichester district of West Sussex have cleverly blended character features with modern luxury. They chose Showerpower to help them create their stunning, retro-style shower and bathroom, which features vintage-look patterned tiles, lighting and a beautifully crafted vanity unit. One of our clients in West Sussex was planning to build a completely bespoke, corner shower enclosure. His 3-sided shower design featured a pentagonal shower base and two cubicle style half walls with frameless glass panels and a frameless glass door. The client, a homeowner in Guildford, asked whether we could make and fit an ensuite 2-sided shower in a new loft conversion. Not only did this mean cutting the glass to fit into an angled space under the roof, but the sloping ceiling was uneven, so the glass shower screen would have to fit the irregular space exactly. Inspired by a holiday in Morocco, our client had created a Mediterranean-style walk in shower for the main bathroom in their home in Worthing, West Sussex. Decorated with bold, spice colours and featuring a large statement overhead rainfall shower, they had beautifully captured the simple, open style and vibrant exotic mood of a Moroccan riad. A couple in West Sussex approached us with a challenge: they wanted to update an existing bathroom which hadn’t been touched for years. The room was tiny and the bath took up the entire width of the room, with the toilet and wash hand basin on other wall. This remarkable project was commissioned by a private client in Thursley, Surrey. The homeowner had converted one of his barns into guest accommodation. He wanted to create an ensuite bath and shower room, within the bedroom, with a real ‘wow’ factor and chose Showerpower to turn his idea into a striking reality! This bespoke frameless opaque cylindrical shower enclosure project was undertaken for a private client in the exclusive Regent’s Park area of London. Having undertaken an extensive refurbishment of his home, which included the creation of a luxurious en-suite bathroom, the owner of one of Surrey’s finest country houses found it wasn’t straightforward finding curved glass to fit his new shower area. This is a story of a super yacht and a curved shower screen. The new owner of the large Victorian house overlooking the village was very pleased to bump into one of the directors of Showerpower™ whilst out walking earlier this year. The conversation soon got around to the works being carried out to his new house and he was very pleased when he learned how Showerpower could assist in the extensive refurbishment of his largely untouched (since the 70s) home. 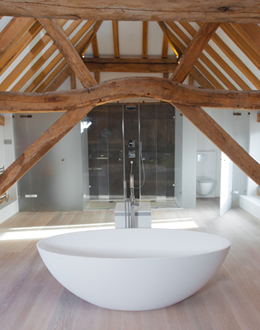 Nigel and Fiona Gibbons, the owners of a large Grade II listed farmhouse in Loxwood, Oakhurst Farm, had specific requirements when it came to selecting a specialist shower door supplier. They wanted: A local company they could talk to and meet with for the briefing and to discuss the project as it developed. Showerpower’s reputation for creating bespoke, frameless glazing in period buildings made us the natural choice for this luxury barn conversion in Witley, Surrey. With Christmas fast approaching we received a call from a gentleman wanting our help. Builders were completing some renovation works at his house in Islington, North London, involving the remodelling of both his bathrooms.